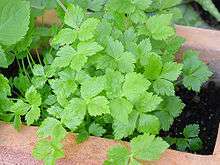 Cryptotaenia is a genus of two species of herbaceous perennial plants, native to North America, Africa, and eastern Asia, growing wild in moist, shady places. Mitsuba's dark green leaves, stems, and pods have an extensive nutritional profile, including high levels of calcium and vitamin C.
↑ Hardway, T. M.; Spalik, K.; Watson, M. F.; Katz-Downie, D. S.; Downie, S. R. (2004). "Circumscription of Apiaceae tribe Oenantheae" (pdf). South African Journal of Botany. 70 (3): 393–406. ↑ Spalik, K.; Downie, S. R. (2007). "Intercontinental disjunctions in Cryptotaenia (Apiaceae, Oenantheae): an appraisal using molecular data" (pdf). Journal of Biogeography. 34 (12): 2039–2054. doi:10.1111/j.1365-2699.2007.01752.x. ↑ Flora of China Vol. 14 Page 80, 鸭儿芹 ya er qin, Cryptotaenia japonica Hasskarl, Retzia. 1: 113. 1855. ↑ Townsend, Clifford Charles. Kew Bulletin 38: 57. 1983.